Like most modellers of my age, began model making as a youngster with my dad, steadily I was able to make descent models and have them hanging from my ceiling in my bedroom, it was a case back then, just to build the kits as per instructions, paint them with a hairy brush, and put the decals on, job done no fuss, I certainly did not bother to much with undercarriage as they were meant to depict them flying and having dog fights with each other, hanging from cotton threads from the ceiling. Reaching an age in life when other things interest you such as drinking, going to the pub with your mates, and not forgetting women, the interest in the hobby soon faded and forgotten about. now some 25-30 years later, the hobby I started as a youngster is upon me again, may be you reach a certain point in life that you have met someone settled down, you find yourself drawn to the hobby you once had as a teenager, but how things have changed with the hobby. There are a lot more things to choose from, resin aftermarket stuff, photo etch etc, now that I have some money, I can splash out on an airbrush, spray booth, more paints, model kits, and loads of modelling tools, you then find yourself with a stash of kits, you know you will never build, but its all part of the fun. 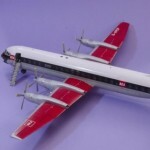 just like to thank Imodeler for voting my model of the Vickers vanguard for the February best in show, as you can see I choose the Revell 1/72 A400M Grizzly, the kit arrived safely and hopefully it will adorn my work bench in the near future.